Childhood weekends navigating the Savannah River led to a business venture for recent Augusta State University graduate Cole Watkins. During a junior year business management class, Watkins was assigned the task of building a company that could survive economic conditions at the time. Watkins’ mother, not knowing he needed ideas for the project, suggested he lead kayak tours. He had one kayak and intended to buy two more. Watkins was tired of people saying there’s nothing to do in Augusta, and he loved the outdoors, so he decided to go with the idea. After earning a top grade on his presentation, he brought to life Cole Watkins Tours. The 23-year-old operates the small business from his Evans home. He created business cards, started marketing with local outdoor stores and bought three more kayaks. A friend developed the company Web site. Watkins is the only guide, leading about one tour a week while keeping another part-time job at a pharmacy. He provides the boat, life jackets, paddles and a ride back to the starting point, if needed. “A lot of people don’t know where to go. They know the river is here, but not where the boat ramp is,” he said. Watkins offers tours of six routes on the river and the Au­gus­ta Canal. Tours last about two hours but can be adjusted for whatever the client wants. Sometimes, kayakers want to do more exploring or stop for a picnic lunch. Watkins talks about the history of the river and points out the best rope swings and swimming holes. 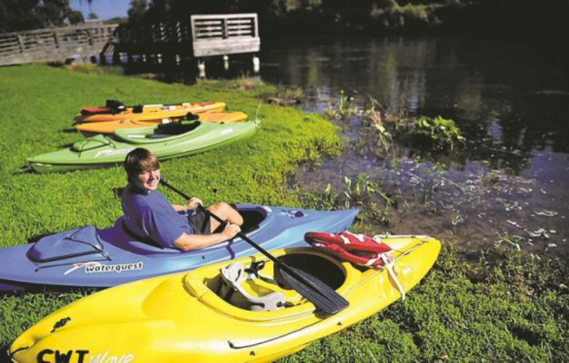 The Savannah River is ideal for beginning kayakers because of the calm waters, Watkins said. He offers tours year-round and rents out kayaks. An elderly couple came back for three more tours after their first experience kayaking with Watkins. Now they have bought their own kayaks.